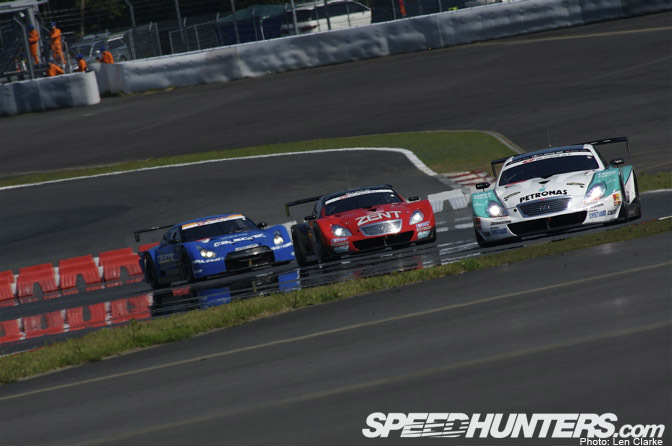 The Golden Week SUPER GT event at Fuji Speedway is one of my favourites of the season. Here's a collection of images that I thought should be seen, but I couldn't fit into the first post about the race. The image above is of Taku Bamba, the guy who so excitingly tried to kill giants in the early stages of Sunday afternoon, only to be foiled and sent to the bottom of the order after that spin into Turn 1… This image os from the latter stages, the third driver stint (and so Bamba back behind the wheel). 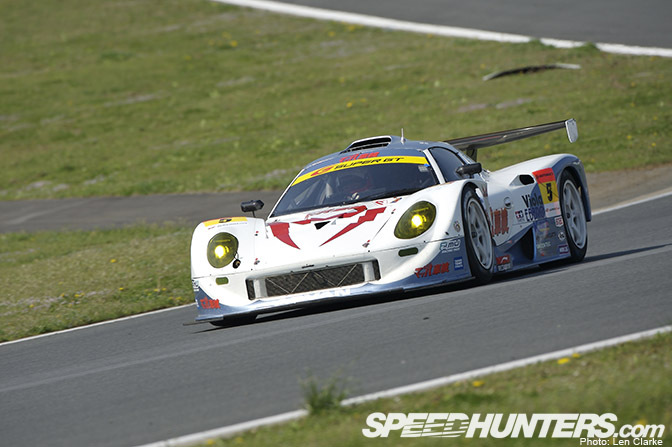 While the car finished in a lowly 14th in GT300, the effort by the drivers – and the team is clearly worth mentioning. Last weekend, they fought like never before. 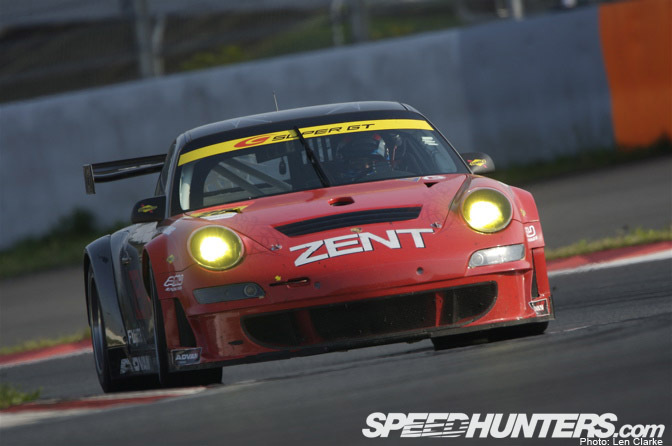 Another GT300 entry making notable progress is the R&D Sport Legacy B4. Once the entire package is fully sorted, there's no doubt these guys will be shaking up the order. Showing part of the expanse of the multiple corner complex from Dunlop up to Panasonic. 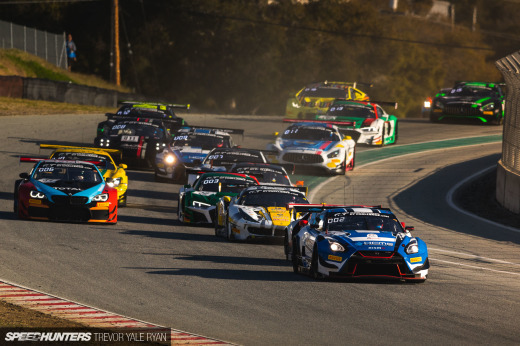 After 400kms' racing, the #24 GT-R of Joao Paolo de Oliveira and Hironobu Yasuda were second among the NISSAN entries with eighth place overall. The ZENT Porsche RSR was particularly potent in the opening stages, though lost out later on. 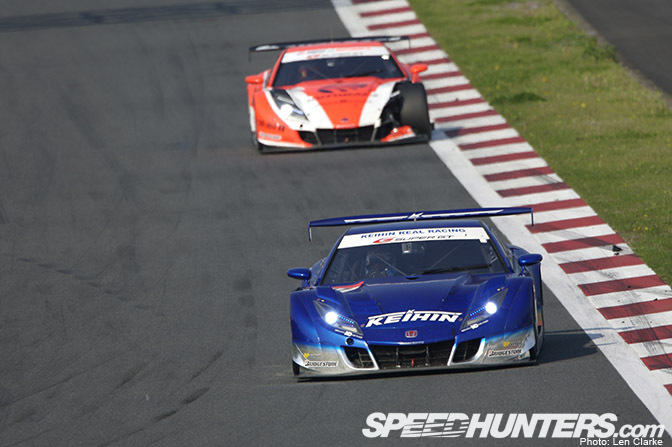 In the end, the car finished seventh in class. 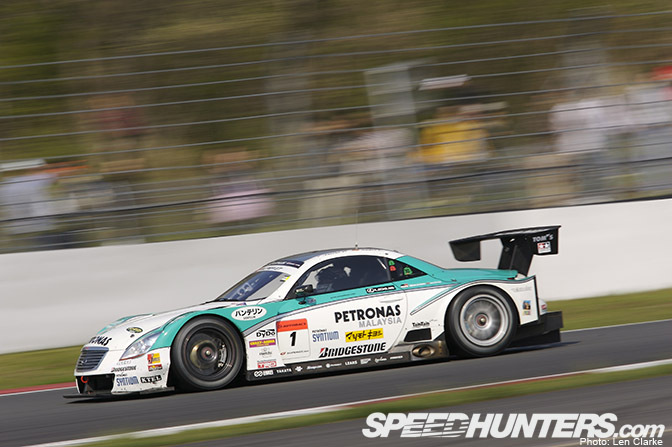 Meanwhile, the Amemiya RX-7 ended up just out of the points with its eleventh-place finish in GT300. They'll be looking for markedly better fortunes next time out at Sepang – a race the car has won before – and also because their title sponsor Mutiara Motors is Malaysian. 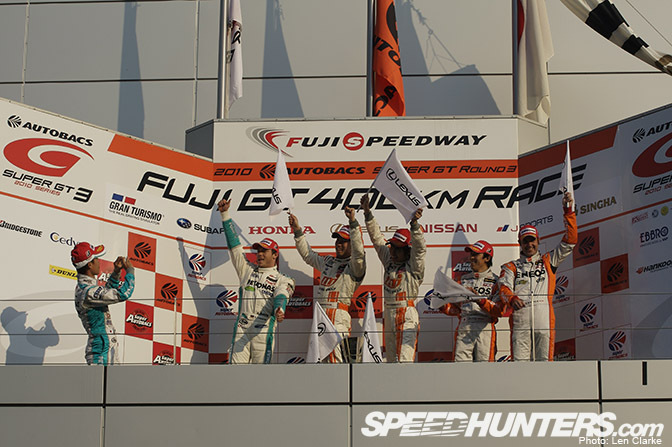 Though it ran a fairly subdued race, the #100 Team Kunimitsu HSV-010GT was tops amongst the Honda runners, and the first machine to cross the finish line after the Lexus stranglehold of the top four positions. For reigning champions TOM'S, Fuji Speedway is their home ground. Their works is a few minutes' drive away. Never ones to disappoint, the squad (the most successful in Japanese motorsport history) netted 2nd on the podium, always maximizing the points-haul when a win isn't forthcoming. Another shot of the #17 Keihin HSV-010GT approaching Dunlop corner as the race wound down. 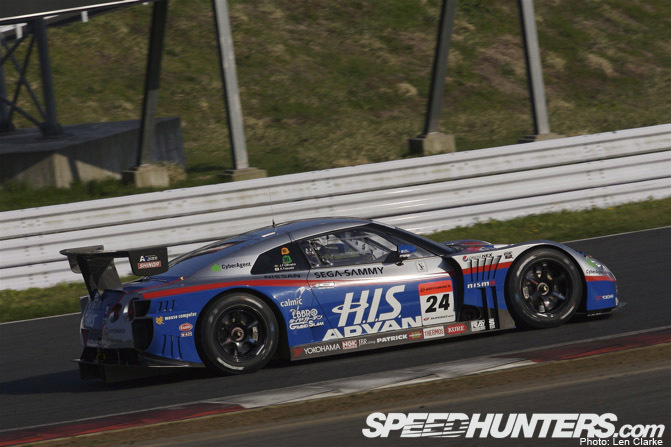 The top NISSAN finisher in GT300, former GT500 drivers Kazuki Hoshino and Masataka Yanagida scoring fifth in class for the marque. I just had to include an image of the wildly-coloured #31 Corolla AXIO. 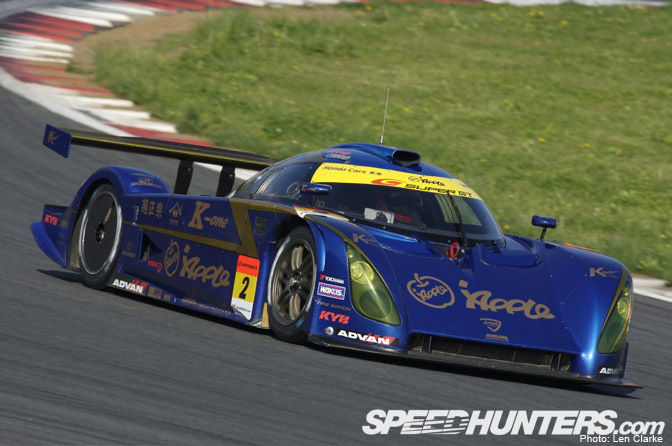 Drivers Matsuura and Saga took points with their ninth-place finish. Here's the #8 ARTA HSV-010GT after repairs were made. Unfortunately, the car would last only a handful of laps before the bodywork gave way once more, causing the left front tyre to explode – and the car to retire. A strong start to the season for the Mooncraft Shiden of Katoh and Hamaguchi went somewhat astray at Fuji, the car finishing out of the points in thirteenth after making it through to SL (Super Lap) on Saturday and seventh on the grid. 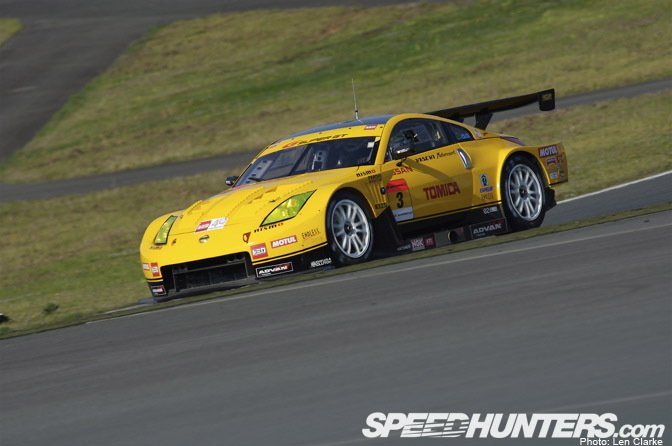 Melvin Choo and Tim Sugden had a torrid weekend at Fuji, their race ending before the halfway point of the 88-lap race. Better fortunes will definitely be hoped for at the next round in Sepang, scene of the team's first ever SUPER GT event last year (as a non points-scoring guest entry). Current champs TOM'S and Team LeMans drivers spray the bubbly all over winners LEXUS TEAM KRAFT pilots Oshima and Ishiura. Classic fun! TOM'S driver Juichi Wakisaka takes a snap of his fellow podium-finishers. Always one to clown around, he never misses an opportunity for a good laugh. 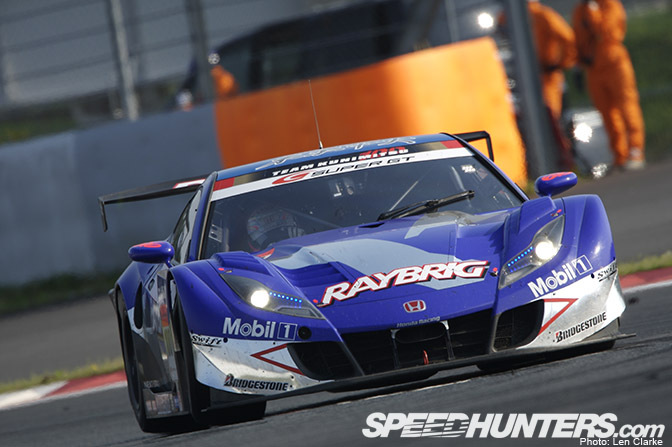 Allright, that's the rest of my coverage from the (first of three) Fuji SUPER GT rounds this season. Hope you enjoyed it! 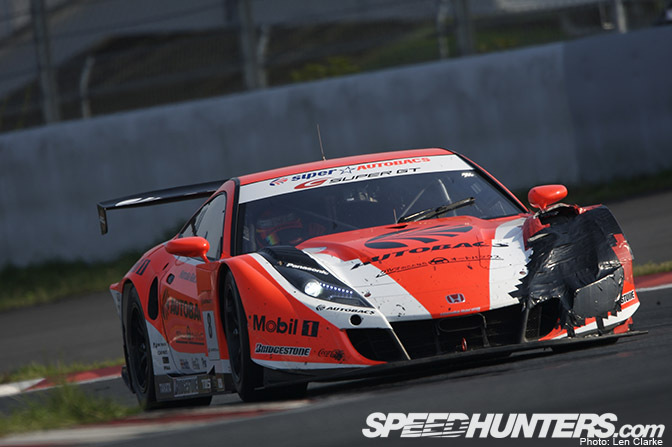 Anyone know if Super GT has any sort of online broadcast in English similar to the FIA GT coverage? 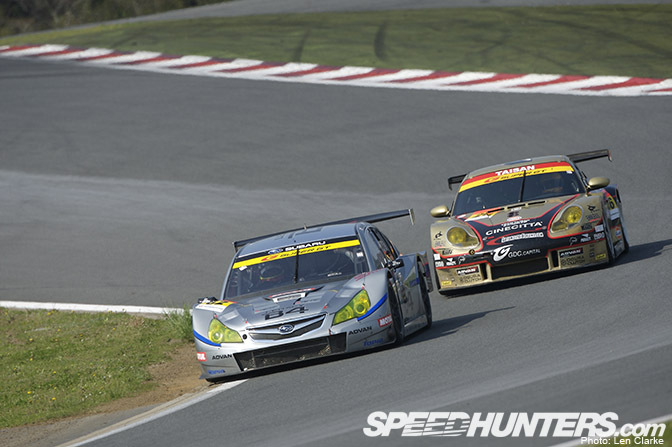 And wow, just looked at the Super GT website, they still use the same basic design they've been using for over 10 years back when I used to keep up with the JGTC. Almost forgot to mention how weird it is to see all those 996's still competing. 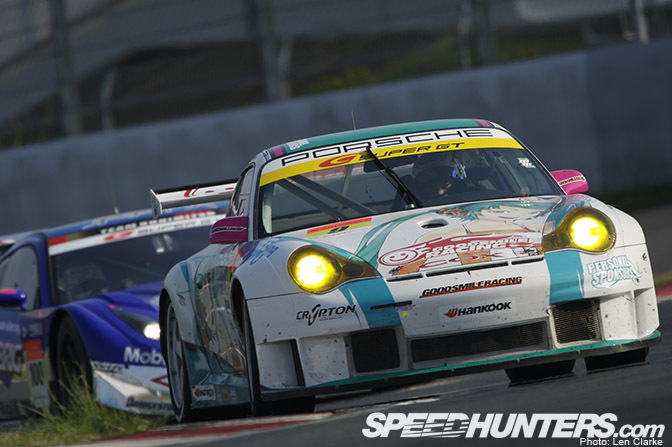 I love SUper GT porsche, I'd love them even more in GT500 against GTRs. 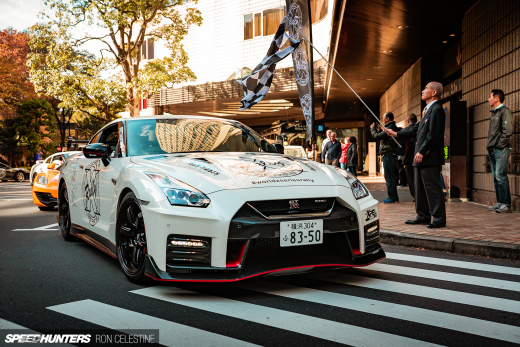 BTW GTRs were running Strange lookin rear fenders ar Fuji, any info on this Mr CLARKE? Also LEXUS SCs had two different diffusers, again, any info on this Mr CLARKE? 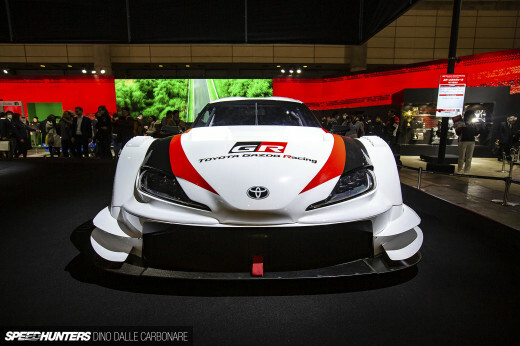 MrZuffenhausen, The #31 Toyota Axio livery is an intepretation of japaneese anime Evangelion Unit-1.